Starbrite's Mold and Mildew Stain Block is engineered to apply a Nano-tech barrier to prevent mold stains and mildew stains from forming on your boat. 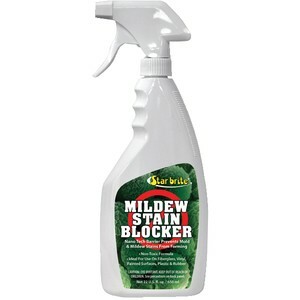 Lasting for up to 6 months (interior) and 3 months (exterior), Starbrite's mold and mildew stain block is easy to use and is a safe non-toxic formula that can be used around people and pets. Perfect for use on your boat's fiberglass, vinyl, plastic, rubber & painted surfaces.